Talk about a fun, and yummy, and easy to make Valentine's Day breakfast! 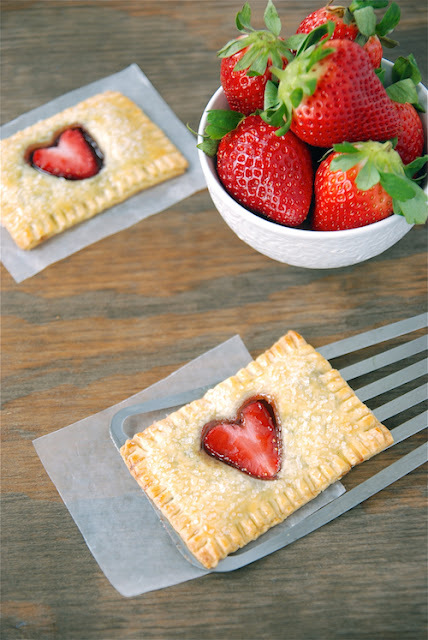 Jessica made her own version of a poptart, but with the addition of a sweet strawberry heart that makes it perfect for the day of love. Not to mention that this is a Nutella strawberry breakfast pastry, so that makes it about a million times tastier than any store bought version. They haven't started making those with Nutella yet, have they? You can get the Nutella strawberry poptart recipe over at The Novice Chef. And don't forget to check out the other featured Valentine breakfast ideas.